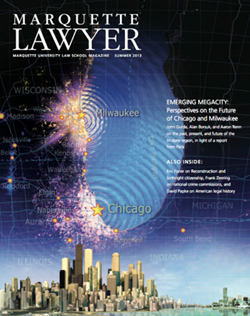 Provocative essays on the future of Milwaukee in the emerging Chicago megacity lead the content of a packed and wide-ranging new edition of Marquette Lawyer, the Marquette University Law School semiannual magazine. The megacity that stretches along Lake Michigan, from north of Milwaukee down through Chicago to northwestern Indiana, was the focus of a July 2012 conference at Marquette Law School, “Milwaukee’s Future in the Chicago Megacity.” The magazine includes two essays building on presentations at that conference: “Rivalry, Resignation, and Regionalization,” by historian John Gurda, and “Flying Too Close to the Sun?” by urban blogger and expert Aaron Renn. My own contribution is an overview of efforts to build cooperation in economic development in the tri-state region. The magazine also presents “The Civil War, Reconstruction, and the Origins of Birthright Citizenship,” an essay by Columbia University historian Eric Foner based on his Boden Lecture at Marquette Law School last fall, and “The Accidental Crime Commission: Its Legacies and Lessons,” by Franklin E. Zimring, of the University of California, Berkeley’s law school, based on his Fall 2012 Barrock Lecture here. Marquette Law Professor David Ray Papke gave a lecture in Uganda on the connection between the law and social power. “Exploring Socio-Legal Dominance in Context: An Approach to American Legal History,” based on his talk, is included in the new magazine. The magazine also contains news of the Law School and of some of its students and alumni. The printed magazine is being sent to Law School students and alumni across the country and to many others. You can get a jump on reading this issue on the Law School’s website. To read the interactive version of the magazine, click here. For all three pieces on the Chicago megacity, click here. Flying Too Close to the Sun?